On a hill overlooking the valley that has become Lake Linganore sits a beautiful little stone chapel dating back to the 1840’s. There is no water or electricity here. It’s lit by candlelight and kerosene lamps, plus a few Coleman gas lanterns, strategically hung outside the windows when dusk approaches. Heat is from a propane furnace in one corner. It takes a while to warm up, and doors open directly into the sanctuary of this one room gem, so cold air rushes in, just as it did a century ago. The simplicity in this age of complexity is strikingly beautiful. 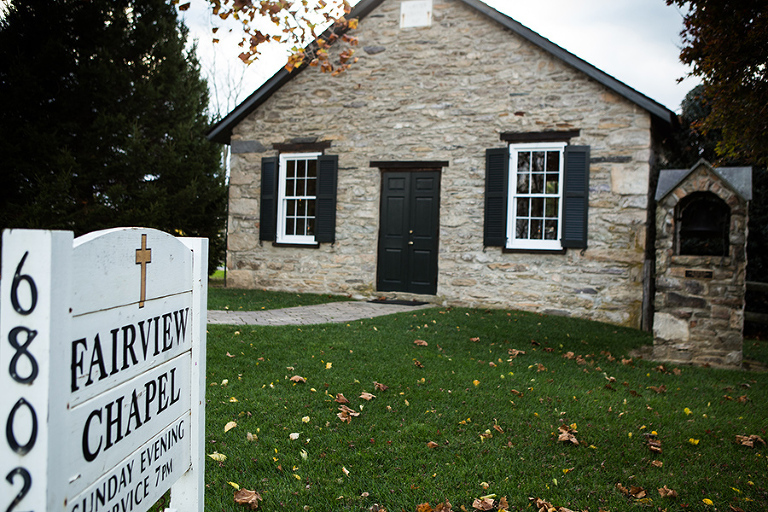 Over it’s lifetime on this hilltop, Fairview Chapel has seen growth and war, marching armies, hospital service, families trying to eke out a living, shrinking attendance and dilapidation, followed by restoration, renovation and historic celebration. During the Christmas season, it’s now one of the marvels on a tour of area churches, decorated as it is in evergreen wreaths, candles and lanterns. On November 1 of 2014, Fairview Chapel also saw the marriage of Diana and Chris. With only family and close friends in attendance, they filled the little chapel, creating an intimate and sharing celebration of union. Diana’s entry music was performed by Chris as her daughters escorted her down the aisle. The service was as simple as the setting, and wouldn’t you know it? Just as the service was to start, the sun came out! We wish their marriage the longevity of this church as they go forward from here. Jeff Behm Photography is an advertising and commercial service with 31 years experience. While we primarily serve Maryland, Pennsylvania, northern Virginia and the greater Washington DC area, our experience has extended over most of North America and much of Europe. Call 724-730-8513 when only the best will do.